An evocative tale of wartime secrets and family loyalty. The story unfurls with a beguiling sweetness, but there's a real sting to this tale. 2011: Now a much-loved actress, Laurel finds herself overwhelmed by shades of the past. Haunted by memories, and the mystery of what she saw that day, she returns to her family home and begins to piece together a secret history. A tale of three strangers from vastly different worlds - Dorothy, Vivien and Jimmy - who are brought together by chance in wartime London and whose lives become fiercely and fatefully entwined. 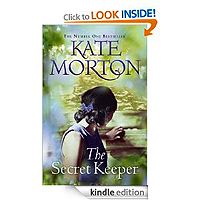 Shifting between the 1930s, the 1960s and the present, The Secret Keeper is a spellbinding story of mysteries and secrets, theatre and thievery, murder and enduring love. Couldn't put it down and yet didn't want to finish it. Wonderful twists and turns. Kate Morton observes her characters so well and you feel you know them. Thoroughly recommend all her books. I have read all of Kate's book with The Forgotten Garden being my favourite up until now. I have to say I loved this book just as much. It was nice to feel a little more up to date in the sense of period. The opening being summer 1961 and then the movement between 1940's and today being great for really visualising the scenes and the characters. I've not read a book in a long while where I have gone from liking a character, to disliking them, then back again so many times. It's a real page turner as I found myself desparate to find out where the story was going. Unpredictable, beautifully written and a lovely story. One of the best books I've read this year. I loved this just as much as her other books. A story that pulls you in deeper as the plot and the characters history develops and evolves. Evocative setting as always, you feel you are in the time and place described without ever being bored by detail. Realistic well developed characters you can identify with, a families relationships with each other are explored from childhood to adulthood while the main plot unravels alongside. A major twist in this one, cleverly written and totally believable, I read it on kindle but honestly wish I'd bought it in hardback now as its deserving of a place in the library.